October 4 marks the 61st anniversary of the launch by the Soviet Union of Sputnik 1, Earth’s first artificial satellite. The Soviets heralded the launch as a national triumph, and the space race between the USSR and the US began. 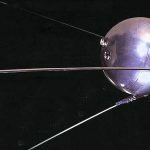 Sputnik 1 was a 58-centimeter diameter, polished aluminum sphere sprouting four antennas and transmitting a 1 W signal on 20.005 and 40.002 MHz, putting it within the range of nearly any radio amateur. Orbiting the planet about once every 96 minutes, Sputnik 1 could be seen from Earth. Following the launch, the US National Institute of Standards and Technology’s HF radio station WWV even halted its nighttime 20 MHz transmissions to avoid interfering with the satellite’s signal. Scientists studying it gained information about such things as the density of the upper atmosphere, deduced from orbital drag. The propagation of its signals also helped to better understand the ionosphere. The US launched its first artificial Earth satellite, Explorer 1, on January 31, 1958.